Universal Robots: Pick and Place Applications with Collaborative Robots - Allied Automation, Inc.
Increase accuracy and reduce waste with a pick and place robot in your fulfillment center to handle pick and place tasks. The UR robot can run most pick and place applications autonomously, allowing your business to handle inventory even when employees have gone home. The intuitive, easy-to-program interface makes UR robot arms perfect for small-volume productions. A collaborative robot arm used in repetitive pick and place tasks offers advantages in productivity and flexibility – letting you free up your work force for more important tasks. Most pick and place applications can be run autonomously by the UR robot arm, making it a perfect pick and place robot. Increase productivity and flexibility with Universal Robots pick and place robots. It requires superhuman abilities to repeat the same movement over and over again for many hours with exactly the same precision. That’s why the UR robot’s repeatability of +/- 0.1 mm (.004 in) is perfect for automating quick-precision handling. Because of their small size and lightweight robot design, Universal Robots pick and place robots can be easily deployed in applications in tight space conditions. Easy programming and a fast average set-up time make Universal Robots robot arms ideal even for small-volume productions, where rearranging large-scale facilities wouldn’t be cost-effective. 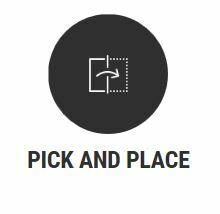 Moving the pick and place robot to new processes is fast and easy, giving you the agility to automate almost any manual task, including those with small batches or fast change-overs. The robot is able to re-use programs for recurrent tasks. All Universal Robots robot arms are certified IP-54. They will need protection when working in corrosive liquid environments.